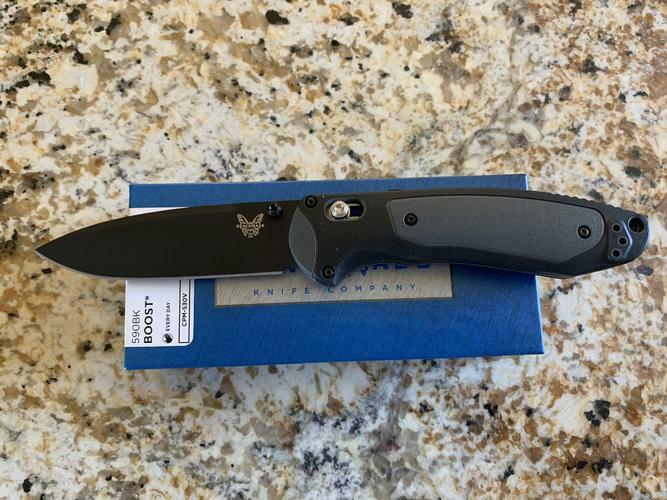 Figured I needed something a bit more substantial than my leatherman blade so I got this Benchmade. It seems a good size to travel with and appears really well made. The edge out of the box is keen. Feels good in hand. Last edited by Paulbuck; 04-10-2019 at 10:54 PM. sharptonn, 32t, Christian1 and 5 others like this. I think they’re one of the better folders available, they definitely feel like quality. I have a Benchmade 490 and had a 470 before that. I’ve been really happy with both. The 470 was S30v, easy enough to sharpen and holds an edge for a while. What steel is in this one? Great choice in my opinion, I have a few Benchmade's and they are top notch for sure. My spring assist is my daily carry knife. Paulbuck and jfk742 like this. The steel is CPM-S30V. I read a bit about it after seeing your question; supposedly a good stainless steel but can be a bit difficult to sharpen. Made by Crucible Industries. Try setting the bevel on a 1k dmt type hone then go to a 1k water hone. I found that edge is pretty usable and lasts a while. I’ve gone up to 12k and everything in between on diamond pastes but the edge life isn’t that great though it can take an extremely fine edge. Bench made is a great blade, ive got a few. Nowadays I’m carrying my Al Mar mostly, but I got a Toggle Lock from Joe Carlton, it’s sweet also. Sorry John, but I,m not in the camp of putting anything more than. A 1k edge on any working knife, that includes kitchen knives. That will cut anything clean. Now that Al Mar is VG 10 holds an edge in the oilfield cutting everything from sacks to wire and occasionally hacking anything in my way ( Scott put me on to it ). jfk742 and Dieseld like this.